Docker can be an efficient way to run web applications in production, but you may want to run multiple applications on the same Docker host. In this situation, you’ll need to set up a reverse proxy since you only want to expose ports 80 and 443 to the rest of the world. 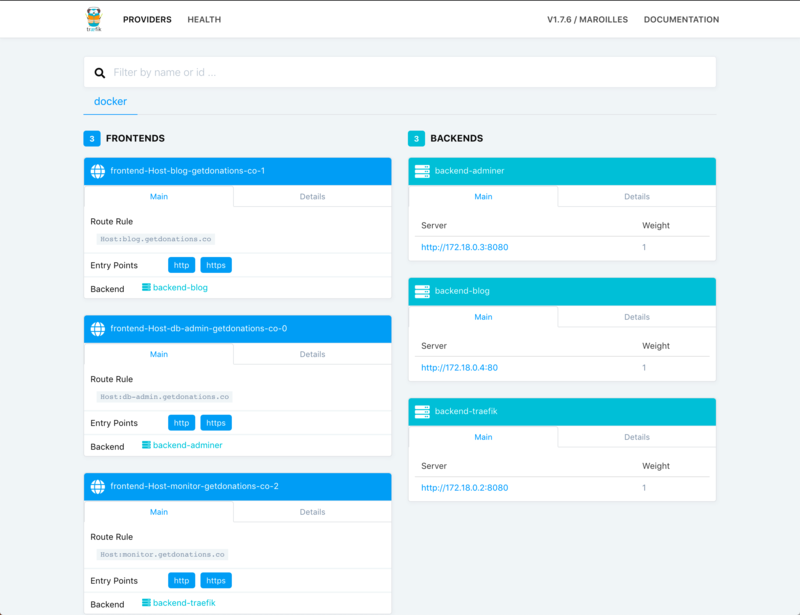 Traefik is a Docker-aware reverse proxy that includes its own monitoring dashboard. In this tutorial, you’ll use Traefik to route requests to two different web application containers: a WordPress container and an Adminer container, each talking to a MySQL database. You’ll configure Traefik to serve everything over HTTPS using Let’s Encrypt. The Traefik project has an official Docker image, so we will use that to run Traefik in a Docker container. But before we get our Traefik container up and running, we need to create a configuration file and set up an encrypted password so we can access the monitoring dashboard. You’ll use this output in the Traefik configuration file to set up HTTP Basic Authentication for the Traefik health check and monitoring dashboard. Copy the entire output line so you can paste it later. To configure the Traefik server, we’ll create a new configuration file called traefik.toml using the TOML format. TOML is a configuration language similar to INI files, but standardized. This file lets us configure the Traefik server and various integrations, or providers, we want to use. In this tutorial, we will use three of Traefik’s available providers: api, docker, and acme, which is used to support TLS using Let’s Encrypt. We'll configure the http and https entry points later in this file. The dashboard is a separate web application that will run within the Traefik container. We set the dashboard to run on port 8080. 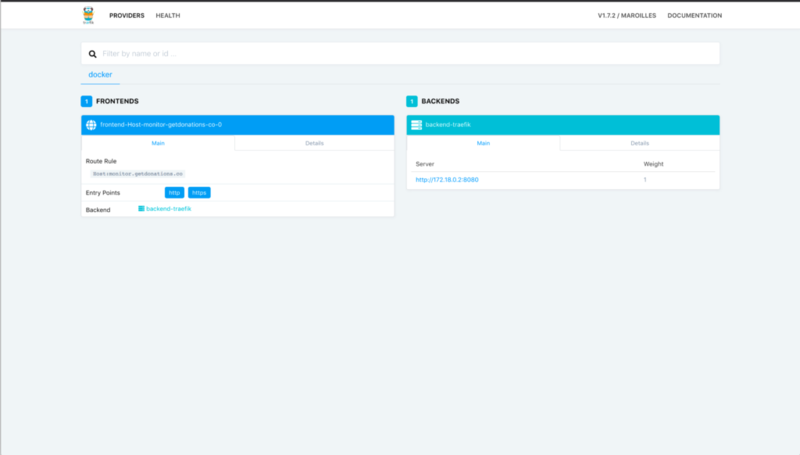 The entrypoints.dashboard section configures how we'll be connecting with the api provider, and the entrypoints.dashboard.auth.basic section configures HTTP Basic Authentication for the dashboard. Use the output from the htpasswd command you just ran for the value of the users entry. You could specify additional logins by separating them with commas. The http entry point handles port 80, while the https entry point uses port 443 for TLS/SSL. We automatically redirect all of the traffic on port 80 to the https entry point to force secure connections for all requests. This section is called acme because ACME is the name of the protocol used to communicate with Let's Encrypt to manage certificates. The Let's Encrypt service requires registration with a valid email address, so in order to have Traefik generate certificates for our hosts, set the email key to your email address. We then specify that we will store the information that we will receive from Let's Encrypt in a JSON file called acme.json. The entryPoint key needs to point to the entry point handling port 443, which in our case is the https entry point. The key onHostRule dictates how Traefik should go about generating certificates. We want to fetch our certificates as soon as our containers with specified hostnames are created, and that's what the onHostRule setting will do. The acme.httpChallenge section allows us to specify how Let's Encrypt can verify that the certificate should be generated. We're configuring it to serve a file as part of the challenge through the http entrypoint. The docker provider enables Traefik to act as a proxy in front of Docker containers. We've configured the provider to watch for new containers on the web network (that we'll create soon) and expose them as subdomains of your_domain. Once you have added the contents, hit ESC to leave insert mode. Type :x then ENTER to save and exit the file. With all of this configuration in place, we can fire up Traefik. Next, create a Docker network for the proxy to share with containers. The Docker network is necessary so that we can use it with applications that are run using Docker Compose. Let's call this network web. When the Traefik container starts, we will add it to this network. Then we can add additional containers to this network later for Traefik to proxy to. Traefik will only be able to use this file if the root user inside of the container has unique read and write access to it. To do this, lock down the permissions on acme.json so that only the owner of the file has read and write permission. Once the file gets passed to Docker, the owner will automatically change to the root user inside the container. The command is a little long so let's break it down. We use the -d flag to run the container in the background as a daemon. We then share our docker.sock file into the container so that the Traefik process can listen for changes to containers. We also share the traefik.toml configuration file and the acme.json file we created into the container. Next, we map ports 80 and 443 of our Docker host to the same ports in the Traefik container so Traefik receives all HTTP and HTTPS traffic to the server. 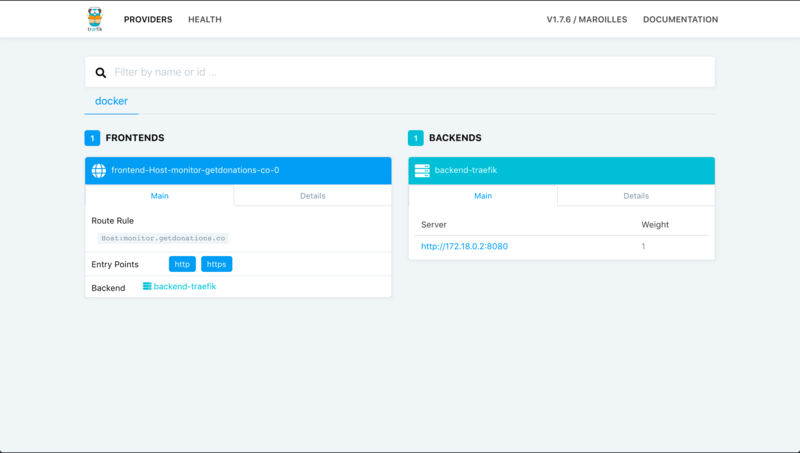 Then we set up two Docker labels that tell Traefik to direct traffic to the hostname monitor.your_domain to port 8080 within the Traefik container, exposing the monitoring dashboard. We set the network of the container to web, and we name the container traefik. Finally, we use the traefik:1.7.6-alpine image for this container, because it's small. A Docker image's ENTRYPOINT is a command that always runs when a container is created from the image. In this case, the command is the traefik binary within the container. You can pass additional arguments to that command when you launch the container, but we've configured all of our settings in the traefik.toml file. With the container started, you now have a dashboard you can access to see the health of your containers. You can also use this dashboard to visualize the frontends and backends that Traefik has registered. Access the monitoring dashboard by pointing your browser to https://monitor.your_domain. You will be prompted for your username and password, which are admin and the password you configured in Step 1. There isn't much to see just yet, but leave this window open, and you will see the contents change as you add containers for Traefik to work with. We now have our Traefik proxy running, configured to work with Docker, and ready to monitor other Docker containers. Let's start some containers for Traefik to act as a proxy for. 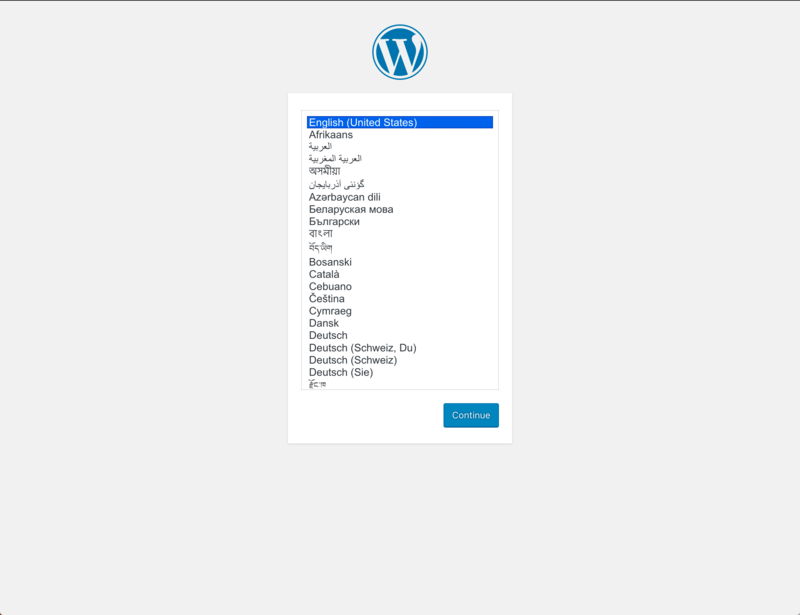 A blog using the official WordPress image. 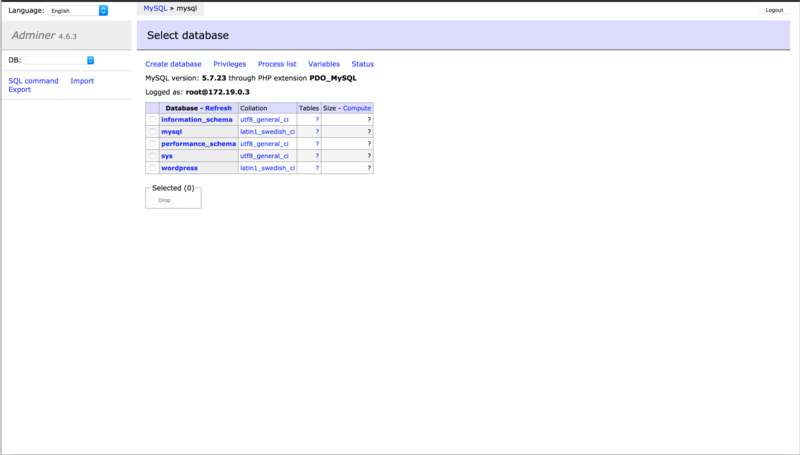 A database management server using the official Adminer image. We use Docker Compose version 3 because it's the newest major version of the Compose file format. For Traefik to recognize our applications, they must be part of the same network, and since we created the network manually, we pull it in by specifying the network name of web and setting external to true. Then we define another network so that we can connect our exposed containers to a database container that we won't expose through Traefik. We'll call this network internal. The environment key lets you specify environment variables that will be set inside of the container. By not setting a value for WORDPRESS_DB_PASSWORD, we're telling Docker Compose to get the value from our shell and pass it through when we create the container. We will define this environment variable in our shell before starting the containers. This way we don't hard-code passwords into the configuration file. traefik.backend specifies the name of the backend service in Traefik (which points to the actual blog container). traefik.frontend.rule=Host:blog.your_domain tells Traefik to examine the host requested and if it matches the pattern of blog.your_domain it should route the traffic to the blog container. traefik.docker.network=web specifies which network to look under for Traefik to find the internal IP for this container. Since our Traefik container has access to all of the Docker info, it would potentially take the IP for the internal network if we didn't specify this. traefik.port specifies the exposed port that Traefik should use to route traffic to this container. With this configuration, all traffic sent to our Docker host's port 80 will be routed to the blog container. 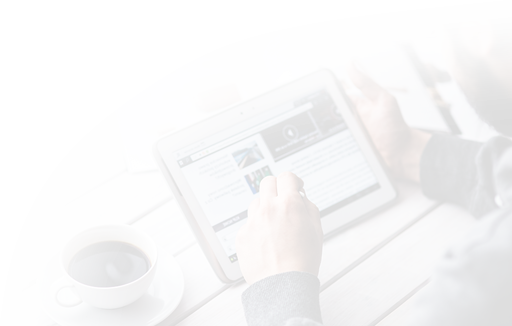 We assign this container to two different networks so that Traefik can find it via the web network and it can communicate with the database container through the internal network. Lastly, the depends_on key tells Docker Compose that this container needs to start after its dependencies are running. 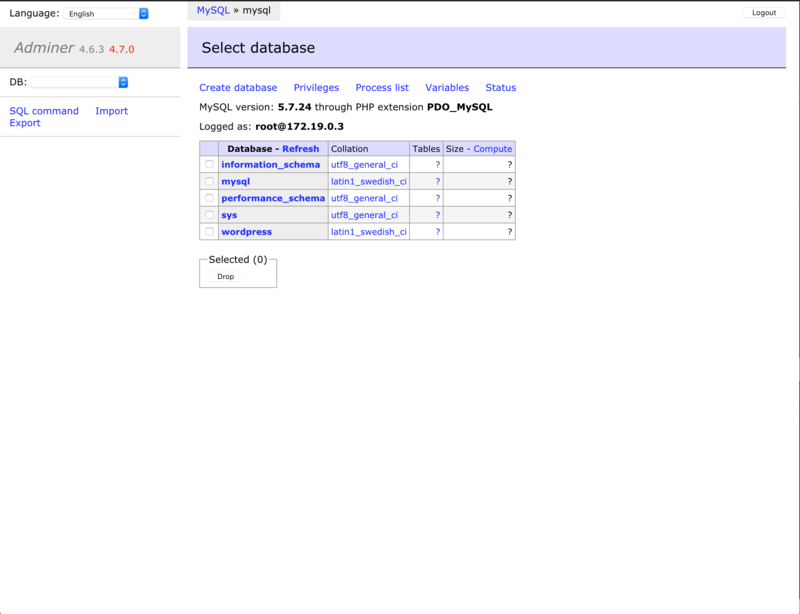 Since WordPress needs a database to run, we must run our mysql container before starting our blog container. We're using the official MySQL 5.7 image for this container. You'll notice that we're once again using an environment item without a value. 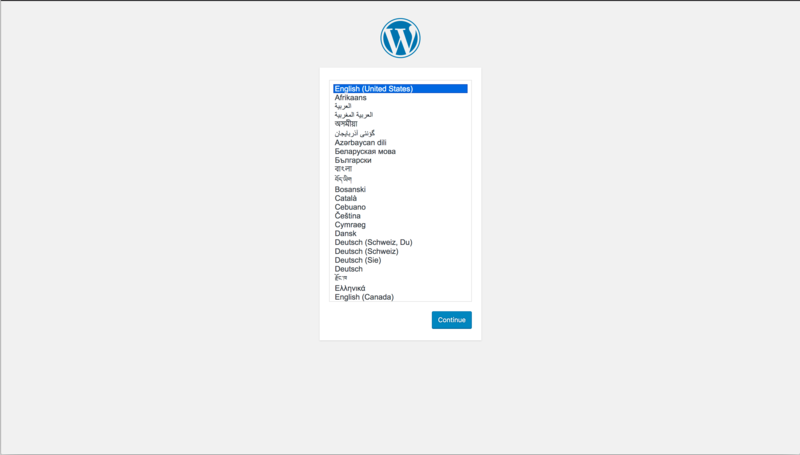 The MYSQL_ROOT_PASSWORD and WORDPRESS_DB_PASSWORD variables will need to be set to the same value to make sure that our WordPress container can communicate with MySQL. We don't want to expose the mysql container to Traefik or the outside world, so we're only assigning this container to the internal network. Since Traefik has access to the Docker socket, the process will still expose a frontend for the mysql container by default, so we'll add the label traefik.enable=false to specify that Traefik should not expose this container. This container is based on the official Adminer image. The network and depends_on configurations for this container exactly match what we're using for the blog container. However, since we're directing all of the traffic to port 80 on our Docker host directly to the blog container, we need to configure this container differently in order for traffic to make it to our adminer container. The line traefik.frontend.rule=Host:db-admin.your_domain tells Traefik to examine the host requested. If it matches the pattern of db-admin.your_domain, Traefik will route the traffic to the adminer container. Substitute secure_database_password with your desired database password. Remember to use the same password for both WORDPRESS_DB_PASSWORD and MYSQL_ROOT_PASSWORD. Now access Adminer by visiting db-admin.your_domain in your browser, again substituting your_domain with your domain. The mysql container isn't exposed to the outside world, but the adminer container has access to it through the internal Docker network that they share using the mysql container name as a host name. Both sites are now working, and you can use the dashboard at monitor.your_domain to keep an eye on your applications. In this tutorial, you configured Traefik to proxy requests to other applications in Docker containers. Traefik's declarative configuration at the application container level makes it easy to configure more services, and there's no need to restart the traefik container when you add new applications to proxy traffic to since Traefik notices the changes immediately through the Docker socket file it's monitoring. To learn more about what you can do with Traefik, head over to the official Traefik documentation. If you'd like to explore Docker containers further, check out How To Set Up a Private Docker Registry on Ubuntu 18.04 or How To Secure a Containerized Node.js Application with Nginx, Let's Encrypt, and Docker Compose. Although these tutorials are written for Ubuntu 18.04, many of the Docker-specific commands can be used for CentOS 7. Before we get our Traefik container up and running, though, we need to create a configuration file and set up an encrypted password so we can access the monitoring dashboard. Save the file and exit the editor. With all of this configuration in place, we can fire up Traefik. This container is based on the official Adminer image. The network and depends_on configuration for this container exactly matches what we're using for the blog container. To learn more about what you can do with Traefik, head over to the official Traefik documentation. If you'd like to explore Docker containers further, check out How To Set Up a Private Docker Registry on Ubuntu 18.04 or How To Secure a Containerized Node.js Application with Nginx, Let's Encrypt, and Docker Compose. 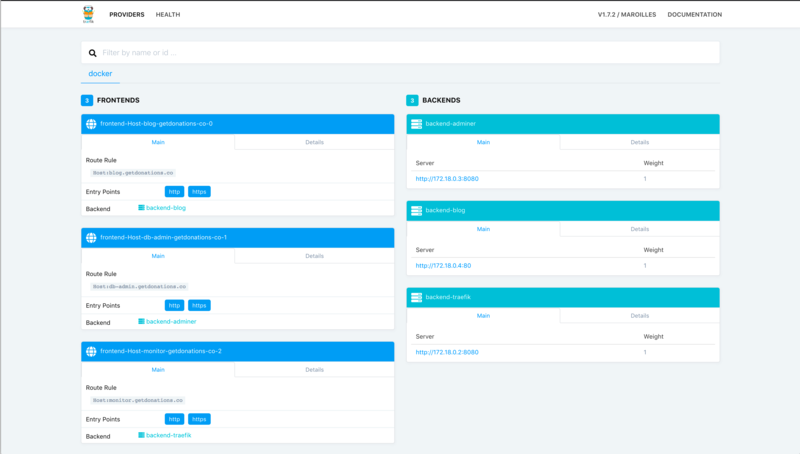 The entrypoints.dashboard section configures how we'll be connecting with with the api provider, and the entrypoints.dashboard.auth.basic section configures HTTP Basic Authentication for the dashboard. Use the output from the htpasswd command you just ran for the value of the users entry. You could specify additional logins by separating them with commas. Then lock down the permissions on this file so that only the root user can read and write to this file. If you don't do this, Traefik will fail to start. Next, we map ports :80 and :443 of our Docker host to the same ports in the Traefik container so Traefik receives all HTTP and HTTPS traffic to the server. Then we set up two Docker labels that tell Traefik to direct traffic to the hostname monitor.your_domain to port :8080 within the Traefik container, exposing the monitoring dashboard. Finally, we use the traefik:1.7.2-alpine image for this container, because it's small. We're using the official MySQL 5.7 image for this container. You'll notice that we're once again using an environment item without a value. The MYSQL_ROOT_PASSWORD and WORDPRESS_DB_PASSWORD variables will need to be set to the same value to make sure that our WordPress container can communicate with the MySQL. We don't want to expose the mysql container to Traefik or the outside world, so we're only assigning this container to the internal network. Since Traefik has access to the Docker socket, the process will still expose a frontend for the mysql container by default, so we'll add the label traefik.enable=false to specify that Traefik should not expose this container. This container is based on the official Adminer image. The network and depends_on configuration for this container exactly match what we're using for the blog container. To learn more about what you can do with Traefik, head over to the official Traefik documentation.